Tuesday, Feb. 5, 5-8 p.m.
• Proof of identity: Birth certificate with a raised/embossed seal issued by the department of vital records or valid U.S. Passport or Passport Card. • Social Security card: The name on your card must match the name on your proof of identity document. • Two proofs of current, physical PA address: Common examples include current, unexpired PA license or ID, vehicle registration, or utility bill. • Proof of all legal name changes: Common examples include certified marriage certificate(s) or divorce decrees(s) issued by the county in which you were married, or court order(s) issued by your county’s family court. Please note: you must show a complete name change history that links your birth certificate name to your current name. If you have a valid U.S. Passport or Passport Card with your legal name, you may use that as your name change document. A representative from the Bucknell University Small Business Development Center (SBDC) will be available by appointment at our Sunburry district office located at 106 Arch St., between 10:00 a.m. and 3:00 p.m. during a special Small Business Outreach Day on Friday, Feb. 15. Statewide, we are looking at a waiting list of over 4,300 children for a childcare subsidy. This is an especially prevalent issue in Northumberland and Snyder counties. We need to make sure there is available funding for high quality childcare programs so childcare is affordable for families in need and for middle-income families. These programs also need to be efficient and effective. 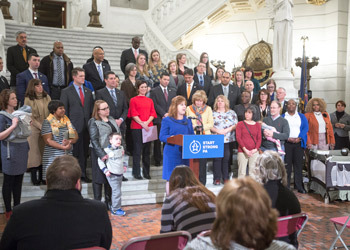 I am proud to stand with Start Strong PA and I will fight for the funding necessary to make childcare affordable for families across Pennsylvania. Applications for the Property Tax/Rent Rebate Program are now available on the Pennsylvania Department of Revenue website, and at my district offices. The Alyssa Dressler Foundation has announced that a free youth heart screening clinic will be open to all PA students ages 12-19 not presently under the care of a cardiologist. All students will receive a free vitals check and electrocardiogram (EKG). If results indicate further evaluation an echocardiogram will be done on site, free of charge. When: Saturday, Feb. 23 from 9 a.m. – 3 p.m. Appointments are required (limit of 150) so head to their website to register. For more information, email info@alyssadressler.org or call (570) 850-9413.